Description Stace family photograph, with Grandma. 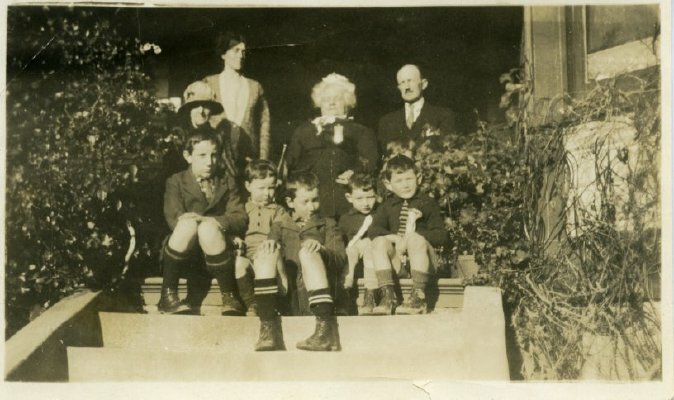 [Grandma is Helen McRae Stace (1850-1926) and four of the boys are Godfrey (born 1912), Ian (1914), D'arcy (1916) and Harry (1920), the sons of Harry (Junior) (1878-1958) and his wife Jane Chaytor (1877-1940) who may also be in the photograph. The fifth boy is Trevor Stace (1921), son of Kenneth Phin (1884-1964) and his wife Rita Benner - see 2009.135.0168 for the same boys taken on the same day - Jenny Pierson 2/3/2012].